Diana, Princess of Wales Memorial Fountain, Hyde Park, London. I was at the Diana, Princess of Wales Memorial Fountain in Hyde Park, London, a few weeks ago with my eight-year old grand-daughter. As the official website says ‘water flows from the highest point in two directions as it cascades, swirls and bubbles before meeting in a calm pool at the bottom’. Although the information on the site says visitors should ‘feel free to sit on the edge of the Memorial and refresh your feet’, it adds ‘visitors are asked not to walk on the Memorial’. Well when I was there, on a pleasant sunny weekday afternoon, it is hardly surprising that a couple of hundred children were walking and running all over the circular memorial having some outdoor fun. My grand-daughter completed about a half a dozen circuits of the fountain, following and then passing groups of children, never seeming to get tired of going round and round. Then all of a sudden she was walking through the water in the opposite direction to virtually everybody else. Well, so what? But it struck me that everyone was moving in an anti-clockwise direction around the fountain (counter-clockwise in the USA). There wasn’t a notice telling the children that they had to move in a particular direction (after all they were only supposed to be splashing their toes in the water), nor was there any discernible difference between the two halves of the circular fountain that might influence the direction that the first children to arrive at the fountain in the morning, might take. Obviously once the early arrivals went in one direction, then the others coming after would be influenced to walk in the same direction, but was anti-clockwise the preferred direction? Athletes on tracks throughout the world run in an anti-clockwise direction. ‘Left hand inside’ was adopted at the first London Olympics in 1908 and it has been used ever since. 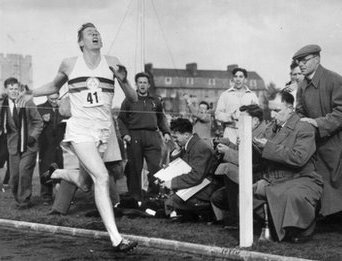 However the UK Amateur Athletic Association left open the choice of direction and as late as 1948, Oxford University athletes still ran clockwise. Some of the reasons advanced for this are, firstly, that with the majority of humans being right-handed, the same applies to your feet, so you push off with your right foot, and you are automatically steered in an anti-clockwise direction. Secondly, with the heart being on the left-hand side of our bodies, running anti-clockwise is more comfortable and reduces the stress on the heart. One study though showed that statistically people tend to turn left more easily than right, although the variability is large. This may suggest that running in a left-hand turn (anti-clockwise) is easier than in a right-hand turn (clockwise). But why? Well the study concluded that ‘veering is related to a sense of straight ahead that could be shaped by vestibular inputs’. Whatever that means, it suggests that the two reasons given earlier are incorrect. The anti-clockwise rule also applies to ice-skating, roller-skating, ballroom dancing, and apparently to aircraft in the circuit waiting to land. But this doesn’t seem to prove much as it doesn’t apply to horse-racing, which can be clockwise or anti-clockwise, nor to motor racing, which is predominantly run clockwise. 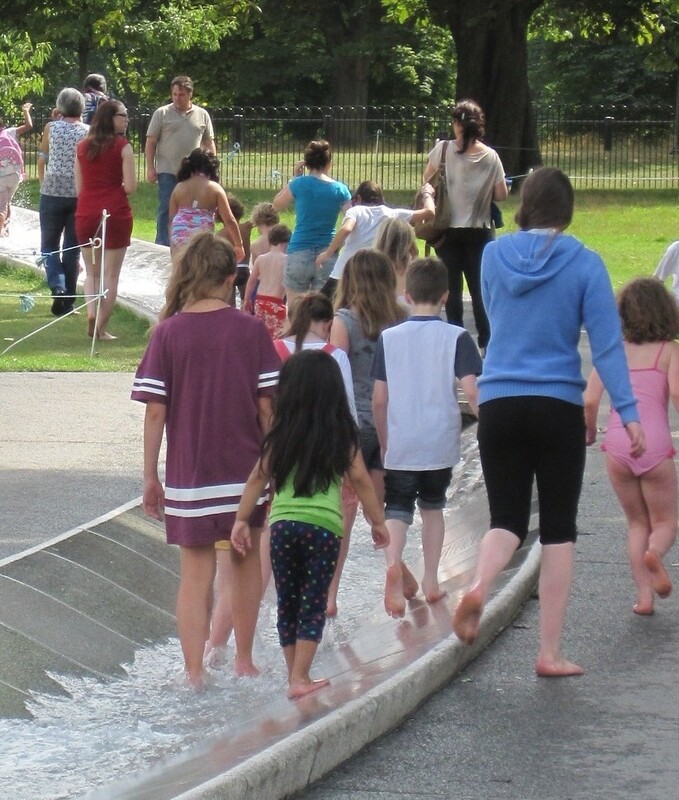 But for the children going round the Memorial Fountain, it does seem that anti-clockwise is their preferred direction.